Address fragile, thinning hair with the Spectral-CSF from global leaders in developing high performance personal care products, DS Laboratories; a unique specialised supplement for women that helps stimulate regrowth. Light in texture, the powerful scientific formula specially tackles female pattern thinning, working with women’s hair length and hair follicular biology to aid in regrowth of thicker, longer and stronger tresses. Utilising unique Nanosome technology to significantly increase absorption, the formula boosts the hormonal structure and fluctuation in a woman’s scalp, aggressively stimulating the follicles thus improving the density and condition of hair. Simply apply 10 pumps of Spectral.CSF with the spray or 1ml twice a day with the dropper. For effective results apply over the area of thinning and rub the liquid evenly over the scalp, always wash your hands with soap and water after each use. You do not need to rinse out the formula after it has been applied. 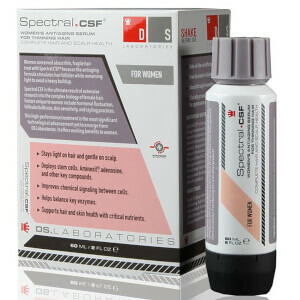 It’s important that you use Spectral.CSF regularly and continue using it to avoid excessive shedding of hair.